Nathalie Kneller: Nathalie’s plan: to announce her pregnancy now that she’s finally made it past twelve weeks! But just as she’s about to deliver (so to speak) the big news to her family, her scene-stealing sister barfs all over the Thanksgiving centerpiece. Yup, Lyndi’s pregnant too, swiping the spotlight once more. Lyndi Kneller:Lyndi’s plan: finally get her life together! She’s got a new apartment, new promotion, new boyfriend. What she didn’t count on, a new baby! She can barely afford her rent, much less a state-of-the-art stroller. Sophia Nunez: Sophia’s plan: Once she gets her daughter Maisey off to college, she’ll finally be able to enjoy life as make-up artist to one of Hollywood’s biggest stars, and girlfriend to one of rocks hottest musicians. But after 18 years she discovers the stork is once again on its way. I’ve long been drawn to books about pregnancy and motherhood, even well before I had my own kids, but it’s been awhile since I read one this dang good! It reminded me of the chick Lit I used to read when I was younger, sassy and smart with relatable characters and issues, I couldn’t get enough. This follows three women at very different stages in their lives making it easy to find someone to relate to. Nathalie is a by the rules kind of girl who has everything in her pregnancy planned out perfectly then there’s her sister, Lyndi who is much more laid back, almost too laid back. Sophia already has one child who’s about to graduate high school so a new baby means starting ALL over. Out of them all I liked Sophia the most but all three were well drawn and went through some growth over the course of the book. Set in L. A. you get a glimpse into the glitzy side of the city as Sophia is a makeup artist for a TV show and you also get to see the over the top personalities and lifestyle choices Cali residents are known for. The modern day look at motherhood is spot on, from online mommy forums to ridiculous gender reveal parties, Rorick nailed every aspect of pregnancy today with humor, this was a funny one y’all! 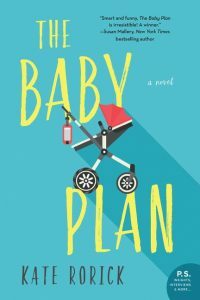 If you enjoy books about friendship, family, parenthood with some sweet and emotional moments add The Baby Plan to your TBR. The Baby Plan in three words: Witty, Funny and Light. Kate Rorick is an Emmy Award winning writer who has worked on a number of television shows, most recently The Librarians on TNT. She was also a writer for the hit web series The Lizzie Bennet Diaries, and authored the two series tie-in novels, The Secret Diary of Lizzie Bennet and The Epic Adventures of Lydia Bennet. In her other life, she writes bestselling historical romance novels under the name Kate Noble. Kate lives in Los Angeles with her family. This sounds like a fun read! Fantastic review! Oooo, this sounds right up my ally! Adding to my tbr now! This sounds like such a fun read! My sister is unexpectedly pregnant with her 4th son – I should give her this book!